One of the other house guests, Jeff Rosenheim (a colleague and head of the Department of Photographs at the Met), impressed us greatly with his knowledge of sea life zoology. He pointed to a small amber object on the sand and said it was an operculum, or gill cover, in this case for a sea snail. In all my years of beach combing I never remember seeing these and he said they are unusual to find. That day, as you can see above, we collected a few dozen. 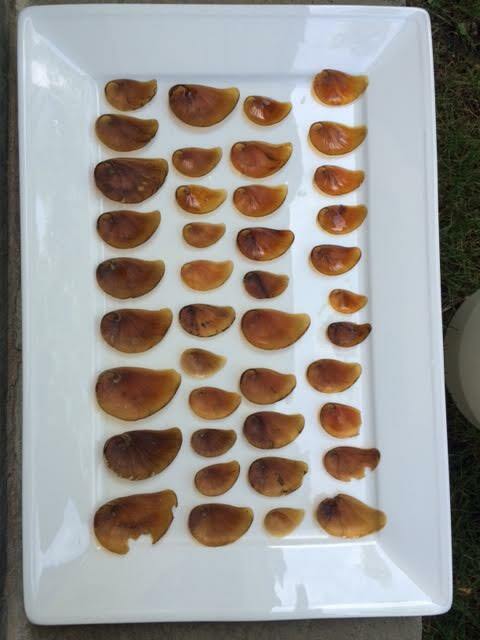 (The other photo shows some with the sort of sea snail they seem to have come from.) We even found a living little fellow who opened and closed his for us when tickled. We returned the favor by getting him back in the water and away from the gulls – who were quite miffed. 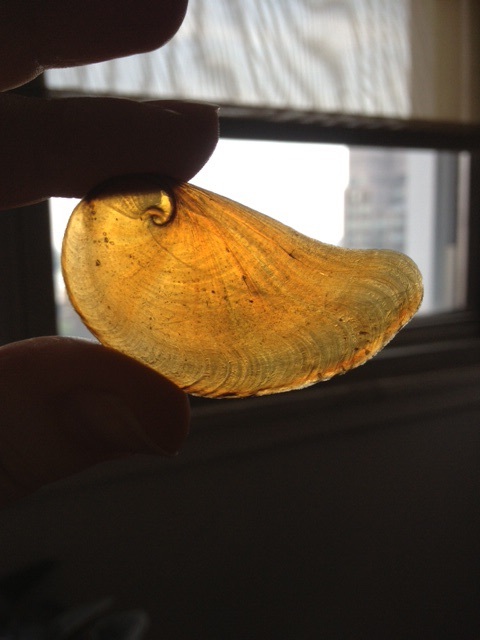 As you can see from the one I am holding up to the light, it has the same pattern and texture as the sea shell, but transparent. Strange and beautiful. Our hostess, Joyce, picked up this handsome crab who also wasn’t familiar to any of us. His meaty claws were snatched away by a hungry bird and he is shown clawless here. This was a very stinky bucket of bits – Wowza! 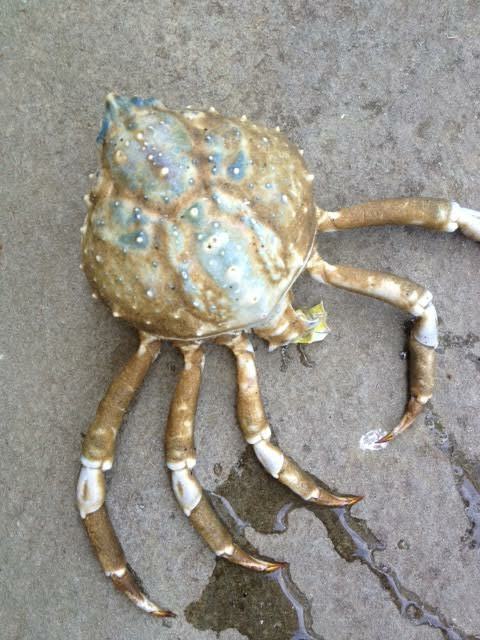 The crab turns out to be a blue spiny spider crab. 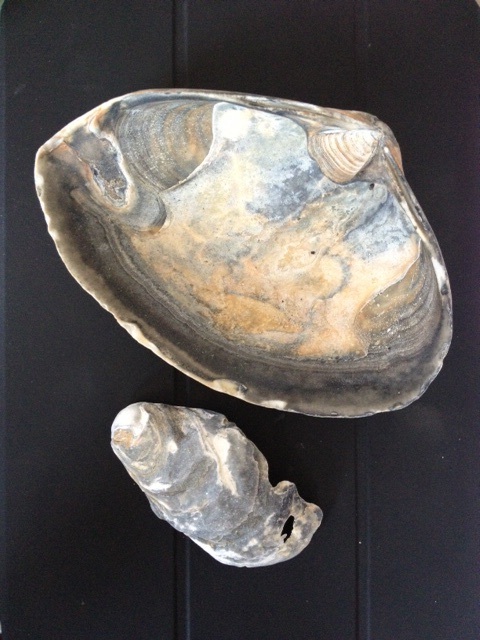 The other shells, oyster and clam respectively, were just pretty.